Like many Torontonians, we love the TTC but we’re often boggled by the way it’s run when it comes to human elements, like their hideous website and merchandise offerings. We are not only distressed at the removal of the Walk Left/Stand Right signs, but also noticed the Please Do Not Block Doorway stickers are no longer in the classic TTC typeface (based on Gill Sans), but a boring and generic sans serif instead. Accessibility expert Joe Clark is alarmed at the TTC’s current renovation plans, which will not only destroy an important part of sign history, but substitute it with what he says an inferior and untested system. This reverses a pilot project that the TTC implemented in the early 1990s at St. George station, which was revamped to display an entirely new sign concept by designer Paul Arthur but was too expensive to implement system-wide. The remaining vestiges of Arthur’s innovative system are to be removed and replaced this summer, and Joe Clark feels that these signs are preservable artifacts. So far, he says that the TTC have ignored his concerns, though he claims that there may be “adequate” good news on the horizon. Toronto-based Arthur, who died in 2001, was a well-known designer of directional wayfinding, and has even been credited with coining the term “signage.” The signs at St. George show a shield-like emblem that would be exlusive to that particular station, and which would also include directional colours (yellow and green) to indicate which line is served by the station. In the case of St. George, the station served both lines, and therefore employed both colours. A red “T” inside a shield would indicate access to surface transit, and large N-E-S-W icons would be highly visible to show the direction traveled. Clark isn’t saying that the stations aren’t in need of some serious renovation—any transit rider knows how decrepit some wall and ceiling panels are—but he laments the apparently imminent destruction of both Arthur’s signage and some original panels from Eglinton station that are slated for removal to make more room on the platform. 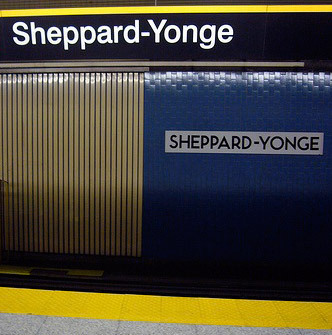 The format that the TTC will roll-out for the renovations is the standard used on the Sheppard subway line, which is a white-on-black Helvetica very similar to New York’s signage, which was revealed in 1974 by modernist designer Massimo Vignelli. The TTC panel that assembled the current sign standard allegedly consisted of non-experts and was done with little consultation, and Clark says that sans serif fonts like the TTC is using are not appropriate for wayfinding signage as they are not easily and immediately discernible for those with impaired vision or on quick glance (which is why highway sign fonts are designed with very specific ascenders, descenders and spacing). Though we don’t particularly dislike the Sheppard Line’s design scheme, it’s clear that the TTC is better at fixing track than appealing to its human ridership, or implementing an effective consistent graphic design throughout the system. Most of what makes people adore each station (and buy buttons to celebrate them) are vestiges left over from the 1950s—the strange tile shapes, stainless steel ticket kiosks, and that fantastic art deco typeface. We like the newer stations too, but the TTC shouldn’t forget why they’re often adored, albeit in spite of themselves.